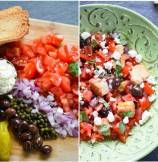 A simple salad packed with sweet and sour flavors! Have you ever tried Dakos in a Greek Restaurant before? If you haven't then I highly recommend trying one at home. 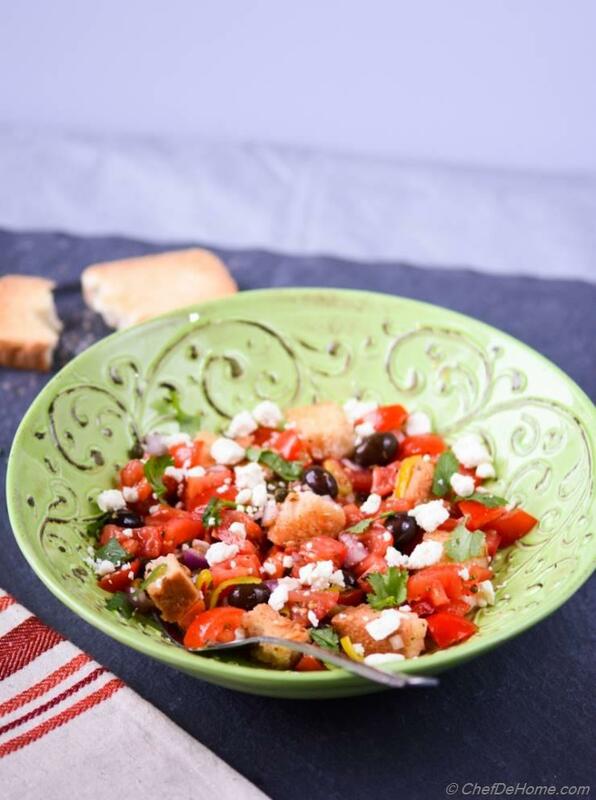 Dakos salad is a simple tomato-based salad, served traditionally over a toasted bread or barley rusk, and has mouthwatering combinations of, some of the well known Mediterranean flavors, like feta cheese, oregano, and olives. 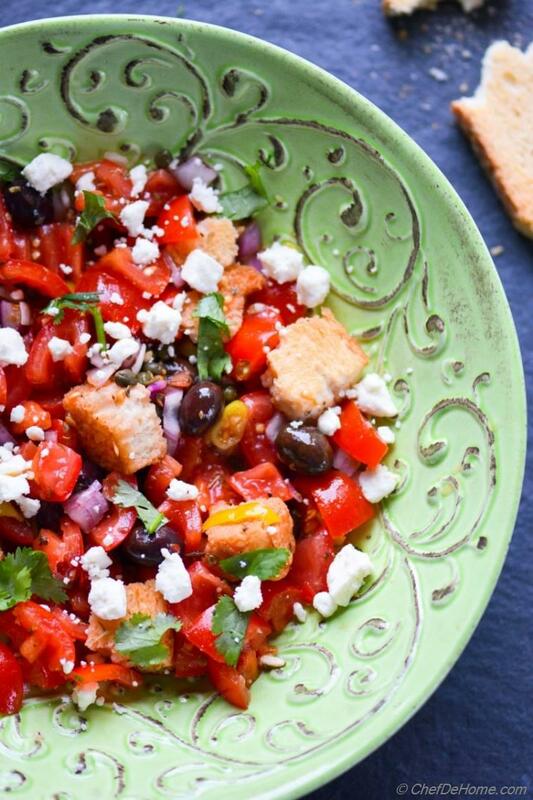 To me, you say name of this salad, and I can taste few yummy ingredients in my thoughts i.e sweet tomatoes and sweet-and-sour soaked bread, almost like a panzanella. 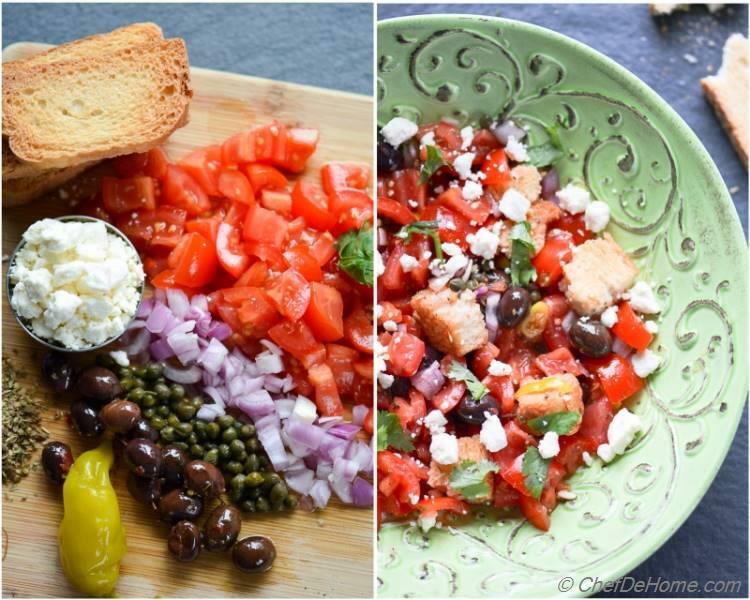 The key to a good Dakos is all in using good quality tomatoes and bread because these two ingredients are heart and soul of this salad. If you cannot find sweet and ripe tomatoes, I suggest wait until you get some. For bread, there are several variations, but one key things is - bread should be toasted and dried so that it can stand up to the juices released from marinating tomatoes and onions. I think, this is why Barley Rusk is most common kind of dried bread used for Dakos salad. Rusk, is a popular dried, twice-baked, little sweet, no-egg breakfast bread popular in European as well as Asian countries. It tastes like a no-egg biscotti or dried sweet white bread. Unless kept in air-tight container, rusks can get soggy pretty quickly, so I always try to consume open packet fast. A few with tea, few ground to make toasted bread crumbs or for binding in pan cakes etc. When I tried Dakos salad, first-time, in a local Greek restaurant, I found barley rusks pretty close to taste and texture of my, old favorite, Indian wheat rusks. Since then, I have always made this salad with Indian wheat rusks. Vishal and I love it every time! For me, it's a moment of hurrah, one more way to use my favorite ingredient! 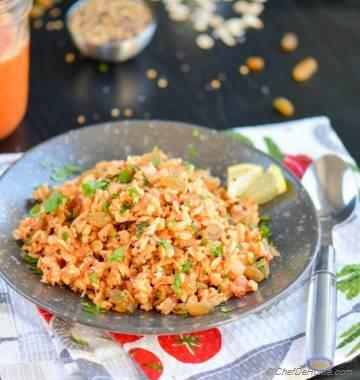 As much as I love this salad for healthy dose of tomatoes, I also love the sweet-n-sour bite of rusk soaked in juices released from salad. A yummy experience every time! I took a long break this holidays! Seems like I am posting after ages when I just shared a recipe last Wednesday. Probably because I missed a lot of things happening around me, missed delicious recipes shared by my fellow food bloggers, and God knows what else!!! May be, everyone else was busy too like me! I hope you all had great holidays and are all set to welcome New Year. Any New Year Resolutions anyone??? I always make a few and then revise'em again this time of the year ;) But, one thing is certain, I am all set to make and share some healthy stuff with you all. This coming new year, let's set goal to eat healthy! 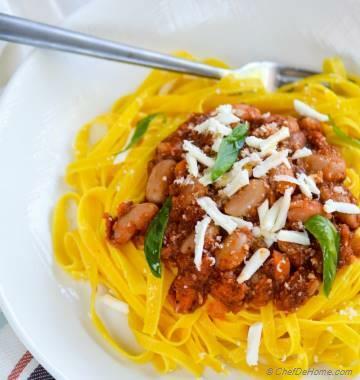 Eat lite, fit and still tongue-tantalizing scrumptious foods. Like this Dakos salad!! This salad is not just packed with flavor, but also has great nutrition value. 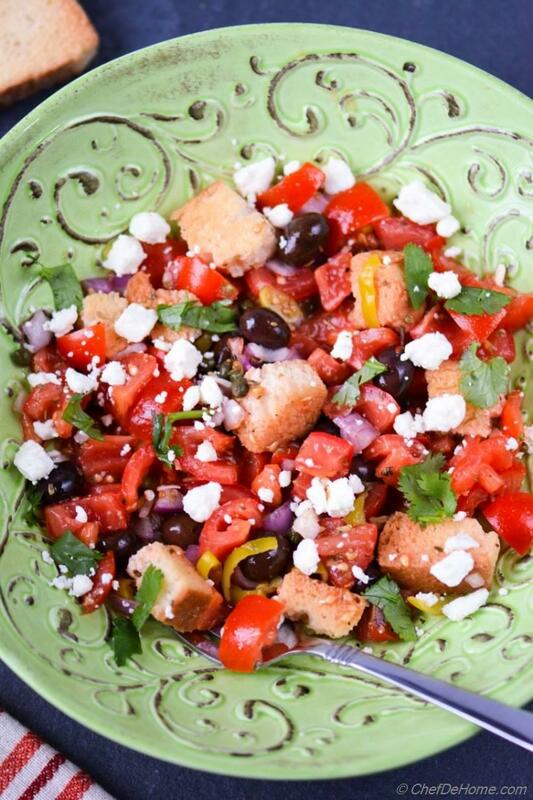 Vitamins and beta-carotene rich tomatoes, omega-3 packed olive oil and olives, with anti-oxidants from oregano and red vinegar, this salad brings lots of healthy yummy-ness to the table. 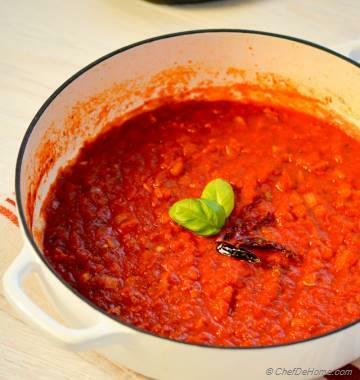 So bring home some ripe tomatoes and make Dakos for lunch! Smart Swap If can't find ripe and sweet tomatoes, use sweet cherry tomatoes instead. 1. In a salad bowl, add all vinaigrette ingredients and using a whisk make an emulsion. Season with 1/4 tsp salt and black pepper (always adjust per taste). Add diced red-onion into vinaigrette and set aside for a quick marination. 2. In meantime, dice tomatoes, parsley, olives, pepperoncini pickled pepper (if using). Add all ingredients to bowl with onion and vinaigrette. 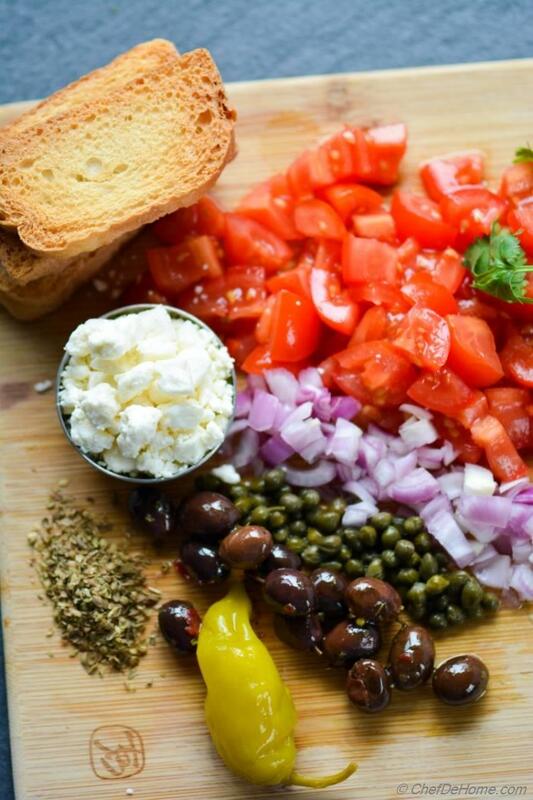 Add capers, and feta cheese. Toss gently to coat everything in dressing. 3. Break rusk pieces and add into the salad, just before serving. When I pack this salad for lunch, I place rusk cubes onto the salad (without mixing) just before closing the lid. At lunch time, simply toss everything with rusks. Rusk will immediately soak some liquid dressing, but will be still crunchy inside, with a delicious sweet and sour bite. Thank you so much! I'm sure you will love it @Padma. Looks very healthy and simple...definitely will try this salad! !